Panasonic's remote cameras go back to school for the third time as world leading robotic camera specialists Roll to Record are once again recruited by production company Twofour for the latest instalment of the Educating series, Educating the East End. The BAFTA Award winning series offers a window into a modern British secondary school, following teachers and students to give a full perspective of school life today. 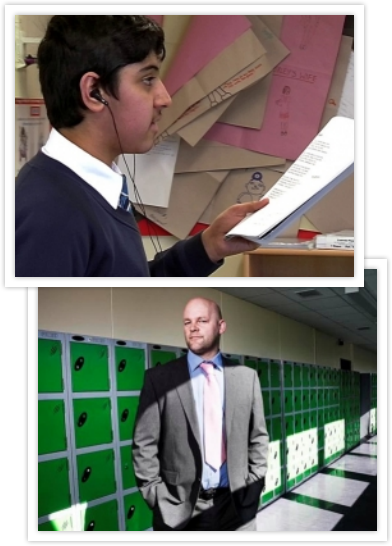 Many would agree that one of the most heartfelt, striking UK television moments of 2013, if not the last decade, was the moment Yorkshire secondary school student, Musharaf Asghar overcame his severe stammer before facing his GCSE oral exam on Channel 4 series, Educating Yorkshire. To capture such a genuine moment of television, Musharaf had to be in his classroom with his teacher, blissfully unaware or at least uninhibited by the subtle Panasonic remote cameras filming his moment which would captivate the UK in the Educating Yorkshire series finale. The moment had to be real and it was just that. "Twofour placed great emphasis on ensuring all the students and teachers were comfortable with the filming process, working with them across a number of months. We complemented this by ensuring the cameras and cables fitted seamlessly into the school environment to cause minimum disruption" said Mike McGaw, Unit Manager at NEP Company, Roll to Record. "The Panasonic remote cameras were chosen because of their high picture quality and low operating noises, imperative in fly on the wall documentary settings like the Educating series" McGaw continued. For the latest series, airing September 2014, Roll to Record installed a total of 68 Panasonic remote cameras into Frederick Bremer School in Walthamstow, east London. Five new Panasonic AW-HE60 full HD integrated pan tilt cameras, were also purchased for the filming of the new series. Since the series' first appeared on UK screens in 2011 in the form of Educating Essex, Roll to Record has adapted to the changing landscape of documentary and reality TV production, making the second series in HD. In 2012, Mike McGraw of Roll to Record said, "The decision to shoot this series [Educating Yorkshire] in HD has been the most significant change to the set-up. In order to accommodate the new format we made a massive investment in Panasonic remote head cameras - which performed marvellously". The moments that Twofour have been able to capture across the three series could simply not be achieved by putting a camera crew into a school. The Panasonic remote cameras have been crucial in allowing us to get the footage we needed without disturbing the school environment." Said Twofour's Head of Facilities, Rick Horne. Twofour, recently named Best Indie Production Company by Broadcast Magazine, has used Panasonic remote cameras to film many productions including Royal Marines Commando School; in which 50 Panasonic AW-HE60 pan tilt zoom cameras were used to offer a behind the scenes look into the experiences of Royal Marines in training.